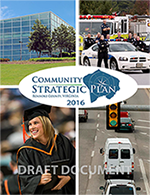 Public comments were accepted on the draft Community Strategic Plan until July 5, 2016. Comments were received online, at community meetings, and at public libraries. and 7 p.m. to 9 p.m. The Board of Supervisors held a work session to discuss recommended edits to the draft Community Strategic Plan on July 19, 2016. On Tuesday, August 9, at 7:00 p.m., the Roanoke County Board of Supervisors held a public hearing to receive final comments on the plan. The Roanoke County Board of Supervisors approved a resolution to adopt the Community Strategic Plan during its evening meeting.